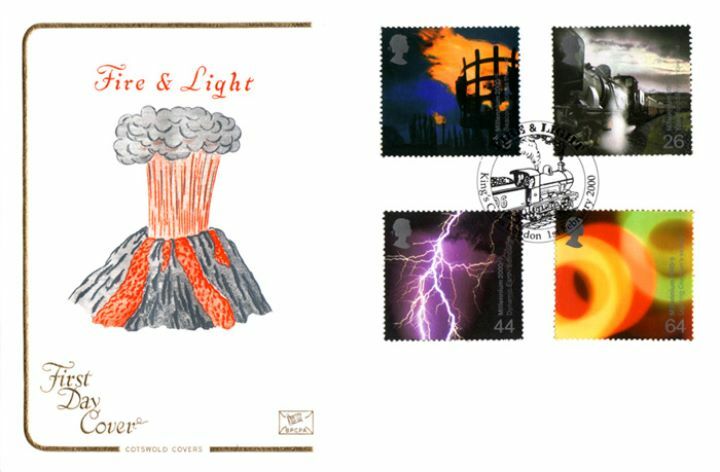 The above Royal Mail Fire & Light stamps were issued on 01 February 2000 by Royal Mail and feature the following stamp designs: 19p Beacon Millennium; 26p Welsh Highland Railway; 44p Dynamic Earth Edinburgh; 64p Croydon Skyline. The Millennium Cover No. 2 first day cover with the King's Cross Special Handstamp postmark has been produced by Cotswold and features these stamps which can make a very collectible and lovely gift.